It’s a retirement-killing mistake far too many fund investors make—and it’s so easy to spot that you’ll be kicking yourself if you fall into this trap! So let’s expose this classic blunder right off the top: I’m talking about buying two deadly types of funds: leveraged and inverse exchange-traded funds (ETFs). 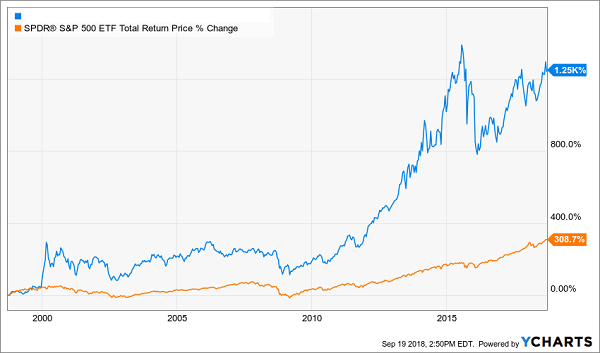 In a nutshell, these funds promise outsized returns by borrowing money and investing that cash in a so-called winning strategy (leveraged ETFs) or by short selling a losing strategy and delivering the returns to shareholders (inverse ETFs). Trouble is, both approaches fail miserably in the real world. 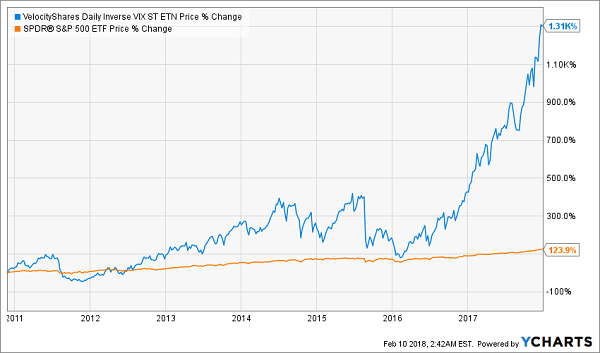 In fact, these ETFs have lost investors millions of dollars since they blossomed in the late 2000s, which is why brokerages are starting to put their foot down. It started with Fidelity, which restricted trading of some leveraged ETFs for some customers back in 2016. But Vanguard has gone further, recently banning all purchases and sales of leveraged and inverse funds. Why? According to a recent statement from the company: “These types of investments aren’t generally designed for a buy-and-hold strategy, even if the ‘hold’ period covers only several days.” But let’s not take Vanguard’s word for it—let’s see what the problems with these funds really are. The biggest misunderstanding about leveraged ETFs is that they’re supposed to track their index’s performance over a long period and, because of the leverage, beat the index by about as much as they’re levered. But that’s not how they work. 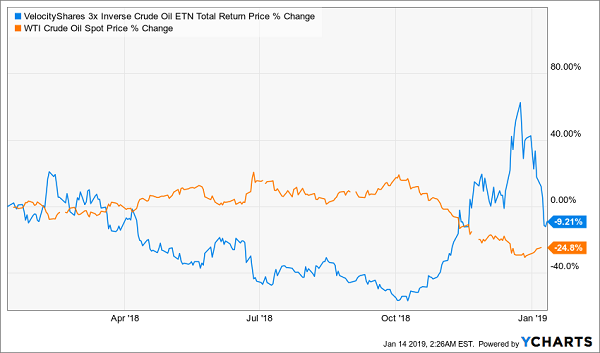 Take, for instance, the VelocityShares 3x Inverse Crude Oil ETN (DWTIF), a leveraged ETF that’s supposed to triple the moves in WTI oil futures. This is both an inverse and a leveraged fund, which means it’s supposed to go up when oil goes down. And while that’s true on any given day, over the long term, holding DWTIF just didn’t work. While oil went down 24.8% in the last year, DWTIF fell 9.2% (by the way, this is pretty much the same story with all the short-oil ETFs out there). This isn’t supposed to happen! With oil falling, DWTIF was supposed to go up. That’s because these funds simply do not work over the long term because of the compounding borrowing costs and the fact that they’re structured to reset every day, which means volatility will eat into their performance. But they do (kind of) work in the short term. Notice the end of 2018, when DWTIF was on a massive tear? The market didn’t expect that move, which helped the fund soar by over 200% in a matter of weeks. And while that sounds impressive, it’s actually terrible. During that same period, options on WTI futures rose by thousands of percent, which means DWTIF was a poor way of trading on a belief that oil was going to fall in price relative to the tools the pros use. And considering that anyone late on the trade lost as much as 44% in a matter of days, it’s clear how dangerous these funds can be for investors who don’t know what they’re doing. Which brings me to the sad story of the VelocityShares Daily Inverse VIX Short-Term ETN (XIV). Nearly a year ago, I wrote about a tragedy that hit many retail investors: the day XIV blew up. If you aren’t familiar with it, XIV was an inverse exchange-traded note (ETN), which is very much like an inverse ETF, with one key difference: it’s technically a debt issuance from a bank (Credit Suisse in this case). And one of the covenants in the debt is that, if the fund falls too much in too short of a time, Credit Suisse can just cancel it, resulting in all investors losing everything. That’s exactly what happened last year. And just like any bubble, if you can time going in and out just right, you can make a good return. But since this was based on the VIX, a marker of market volatility that no one has ever been able to accurately predict, getting in and out of this bubble was much easier said than done. There are many such risky funds out there that have great-looking charts hiding dangers. The Direxion Daily S&P 500 Bull 3X ETF (SPXL) is up an absurd 964% since its inception, while the S&P 500 is up 151.4% at the same time. But market corrections are cruel to this fund, which fell over 20% in the last month and a half. 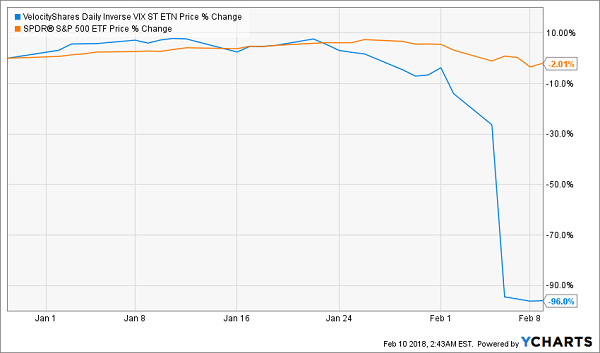 The next time a crisis triggers a big downturn, like a 40% drop in a few weeks, this fund will suffer XIV’s fate—leaving a trail of broken hearts and busted portfolios in its wake. I don’t know why anyone would mess with dangerous inverse or leveraged ETFs when you could simply pick a handful of buys from the 18 far safer funds I’ll show you now. When you do, you’ll pocket a retirement-changing 8.5%+ dividend year in and year out—starting today! They’re the 18 retirement lifesavers in my CEF Insider service’s portfolio—and I’m ready to GIVE you instant access to all of them right now. All you have to do is “kick the tires” on CEF Insider today with no risk and no commitment whatsoever. These 18 powerful picks are all a special kind of investment called a closed-end fund (CEF). Taken together, they hand you that incredible 8.5% average payout! So a $400,000 investment would hand you retirement-changing $34,000 in dividend income this year alone. Better yet, most of these dynamic funds pay dividends monthly—so there’s no more waiting 3 full months for your next payout! AND you get all of this without taking the heart-stopping risks folks who buy leveraged or inverse ETFs are forced to stomach. It pains me to see folks making investing much harder than it needs to be by purchasing overly complicated (and dangerous) investments like inverse and leveraged ETFs. Especially when there are far easier (and safer) options available, like the 1-click CEF buys I’ve got waiting for you now.